It takes a certain kind of person to want to face the perils and hardships of Alaska’s Arctic National Wildlife Refuge. Grizzly bears, polar bears, wolverines, wolves and extremely bitter cold weather would soon make anyone hesitant to explore the area. But none of that deters James Campbell or his 15-year-old daughter, Aidan. 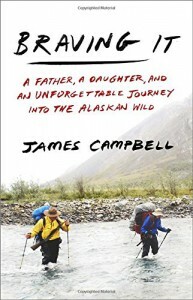 Campbell and his daughter actually make three trips to Alaska. The first is to help James’ cousin Heimo build a new cabin in the wilderness. The second time they return to help Heimo and his wife Edna set up their trap lines and hunt. Their last trip is to hike across Alaska’s Brooks Range and to paddle the Hulahula River in a canoe. The book is written in a very down-to-earth engaging manner. The author gives you a front-row seat to all of the adventures and I feel like I made the journey with them without all of the dangers or discomforts. What I liked best about the book, though, was reading about the relationship between this father and daughter and their love for each other despite their ups and downs. There is suspense and humor and beauty. The only caution I would have is for those of you who may not enjoy reading about hunting and trapping as there are some explicit scenes. That is not something I personally care to read about and I did skim those parts. But the rest of the book held my interest and I enjoyed the adventure.